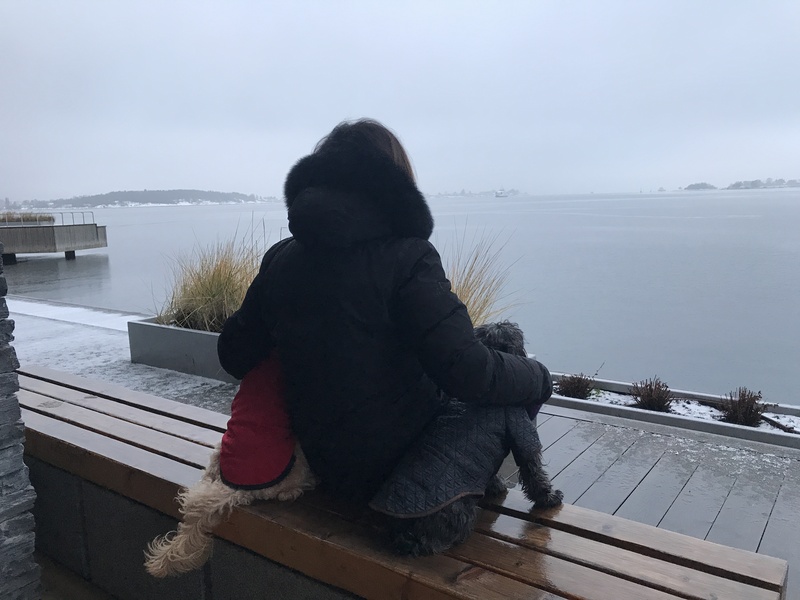 One last morning walk in Oslo … Pondering about what lies ahead – what’s beyond the horizon for us? We’ve checked out of the hotel and sat waiting in the lobby for the taxi to take us to the train station. 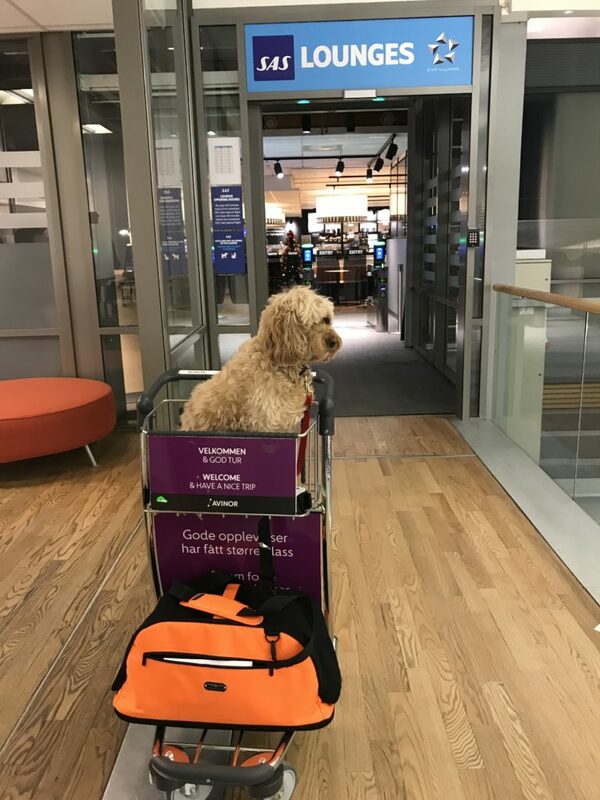 Our experience with taxis in Norway had been brilliant – they are pet-friendly! We took the Airport train – all of maybe 25 minutes. 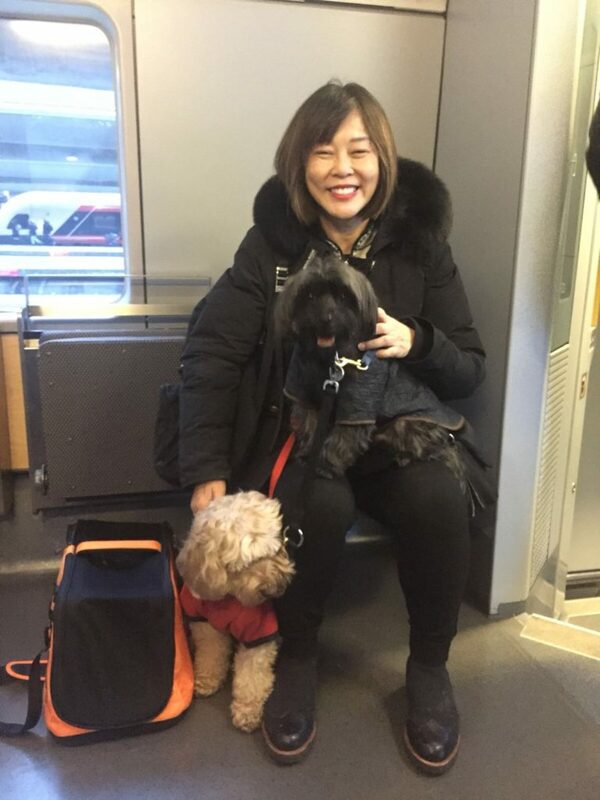 And like all the other trains in Norway, Mummy had learnt to look for the carriage that is pet friendly – and it seems – it is always the last carriage. 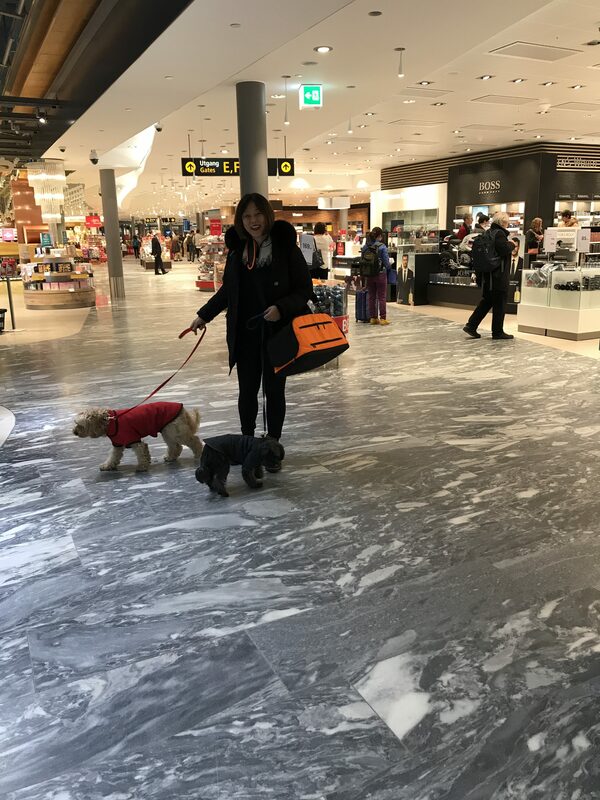 Mummy’s loaded down with backpack, handbag, George’s travel bag and BIG Wheelie was being “managed”and controlled by our friend, Catarina – who took our photo! Thank you! 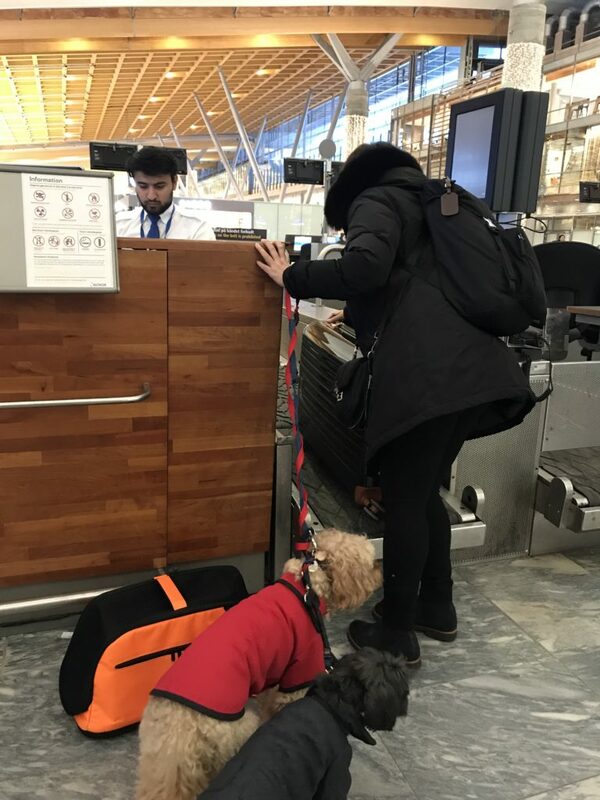 We arrived at Oslo Airport and with heart in throat, Mummy approached the SAS desk to check-in … this is the part when Mummy holds her breath … if anything were to go wrong here, this is where it began. 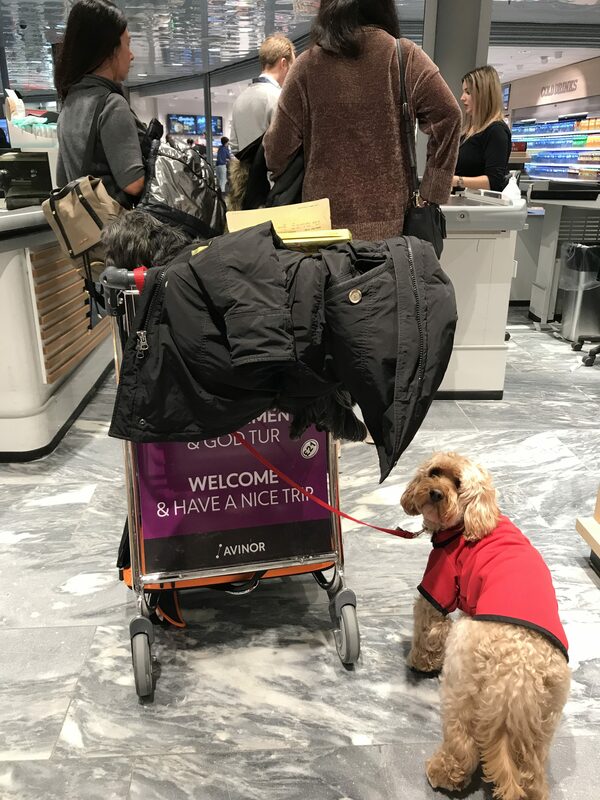 The check-in person asked if Mummy had paid for our travel – and Mummy shuffed him a whole stack of papers that he could possibly want! After a phone call to someone, all was clarified and we could even go through the Fast Track security. Going through the security check, we had to be off our leads. Dutifully, we both just walked right through … Mummy was so proud of us. Instead she beeped! LOL! Her titanium hip always sets off the alarms! :). We had to wait for her while she got frisked! All done. We made it to Duty Free! 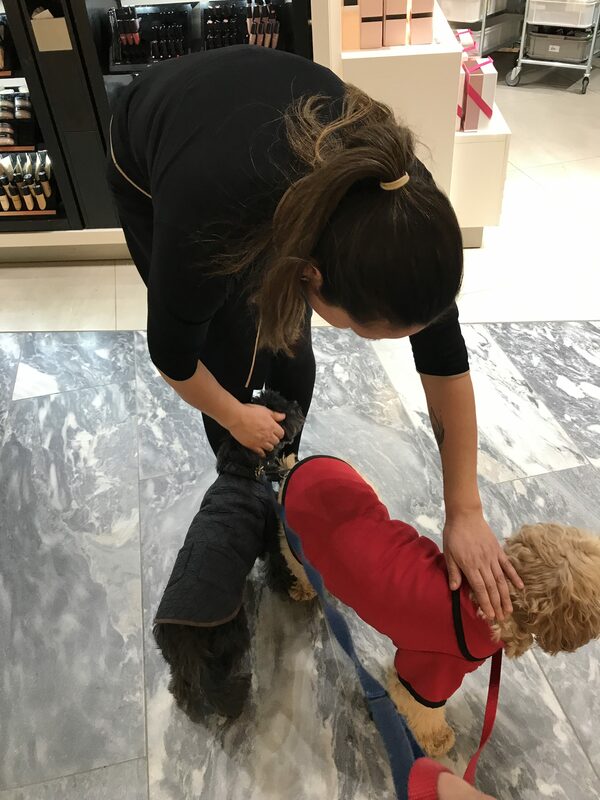 Mummy walked us boldly through – still anxious if she was going to be told we had to be in bags – but a few of the Duty Free hoomans stopped to say hello and fussed over us. 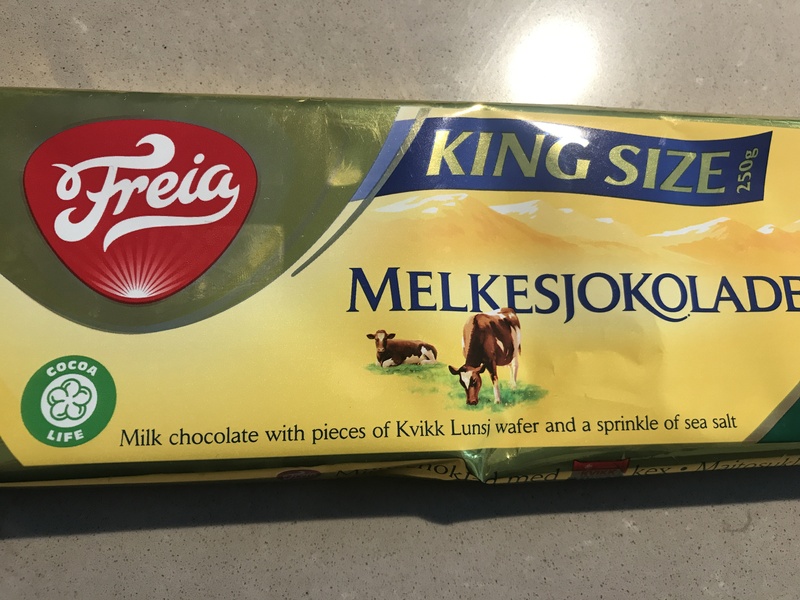 But then she had to buy some king size Freia Norwegian chocolates – her hands were full and she resorted to using a cart. George got to sit in it, her coat piled on top of him. Bags unloaded – this was a good solution. 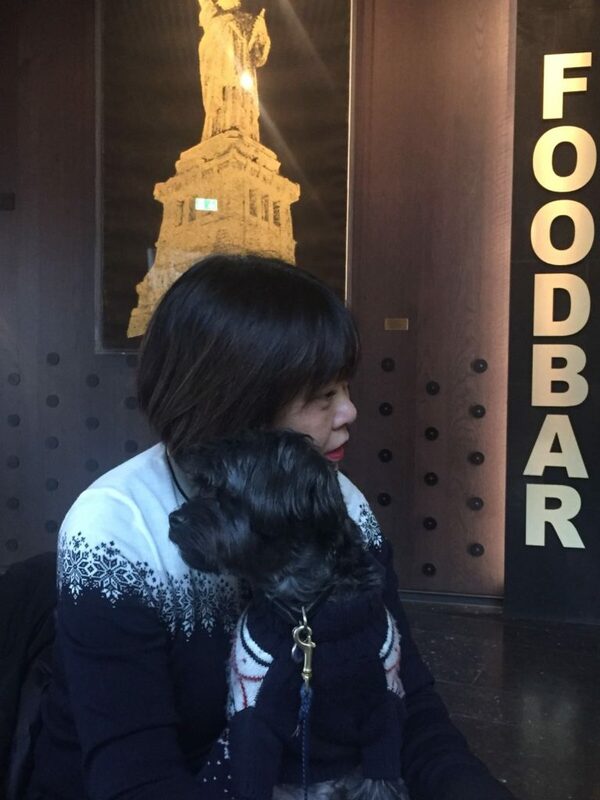 Mummy could have gone into the SAS Lounge but dogs were not allowed in – sadly. While we waited outside when Mummy went in to use their facilities, the staff who kept an eye on us made a comment upon her return – “They’re so calm and quiet.” Why was she so surprised? So we concluded that the reason for us not being allowed inside – they expected dogs to misbehave. 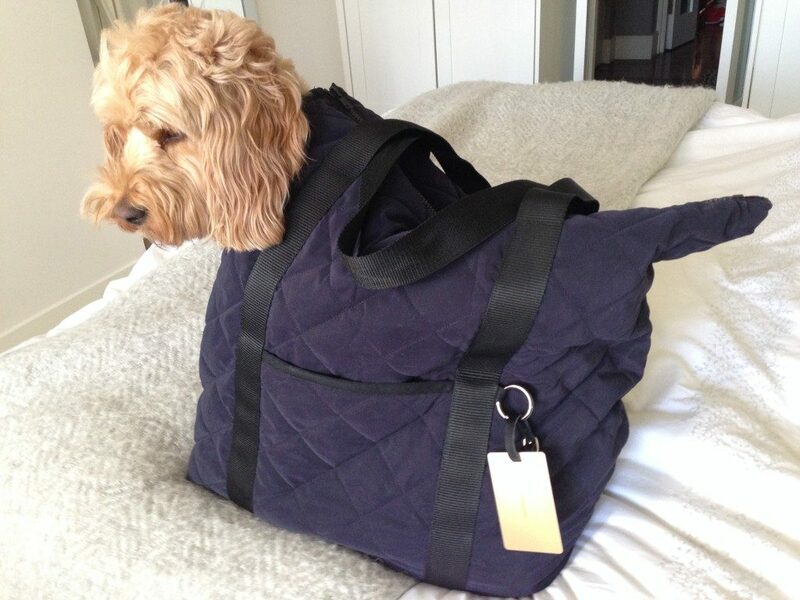 When it was time to go to the gate and Mummy ushered George into his travel bag – which he was familiar with by now. 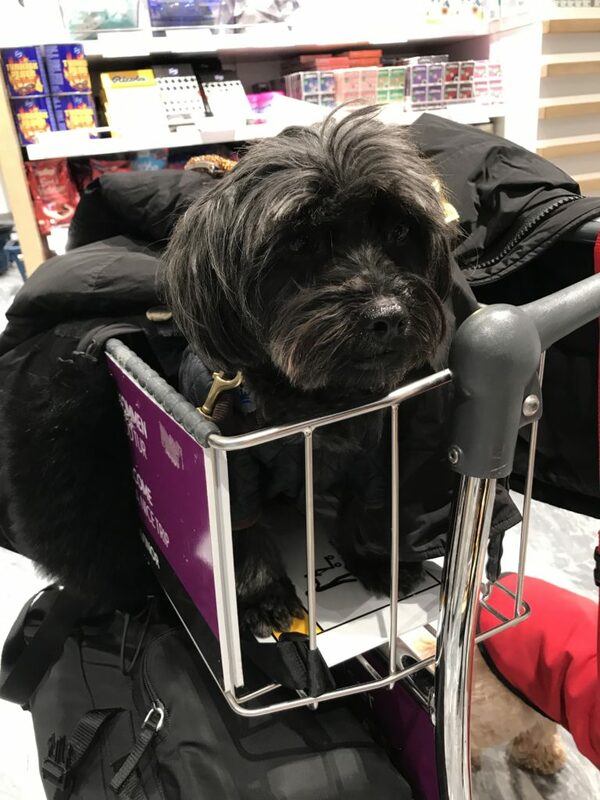 I sat on the cart too as Mummy had put on her coat and backpack in place. We were ready for the next part that could be a problem. 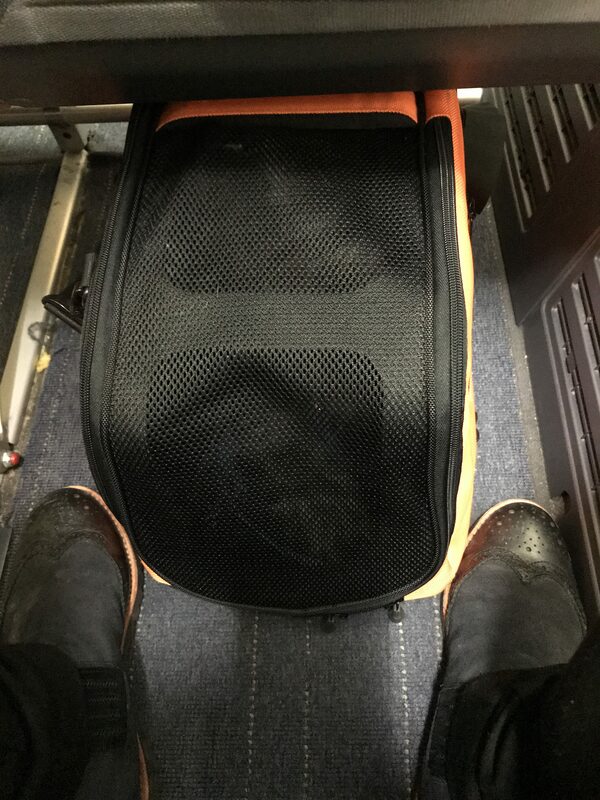 As we approached the desk at the gate, the lady smiled and said they were ready for us – but I too had to be in a bag! Aha! She had been told otherwise – as I was travelling as an emotional therapy dog and I needn’t be in a bag. But alas not. 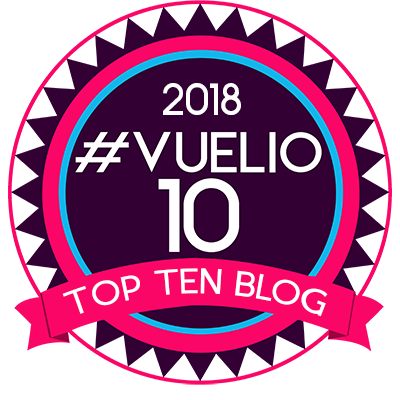 Mummy, nervous and prepared, had brought my tote bag – and that was perfect! This, we were told, was mainly for the purpose of making sure we do not go to the toilet! 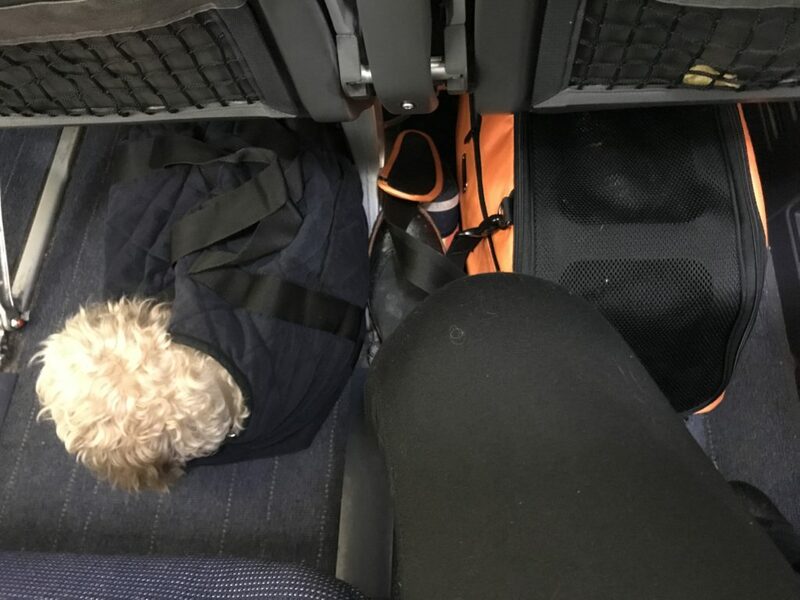 We boarded – George in his bag went under the seat in front of us. They had apparently cleared the row – so I sat on the floor all curled up in my tote bag under the next seat and went to sleep-for take off. 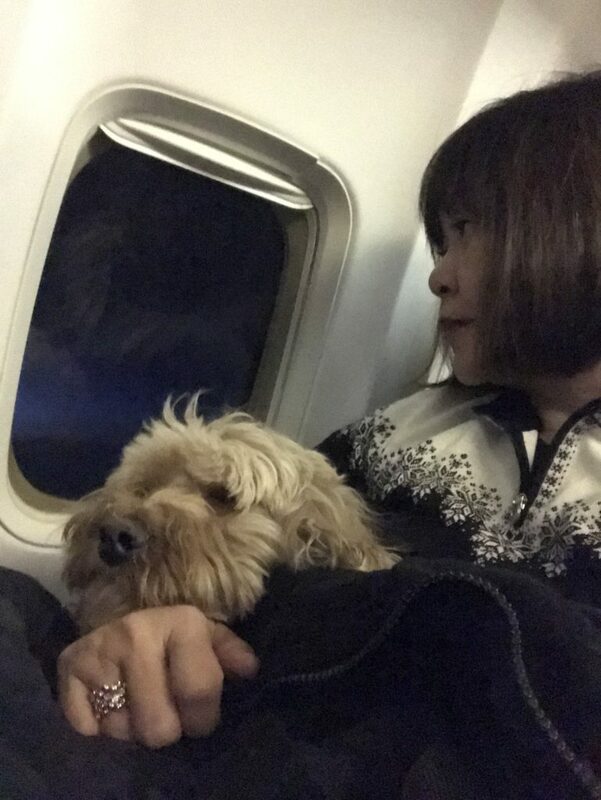 But during the two-hour flight to Düsseldorf, I sat on Mummy’s lap. And snoozed all the way. I went back down on the floor for landing but soon, we were getting off. 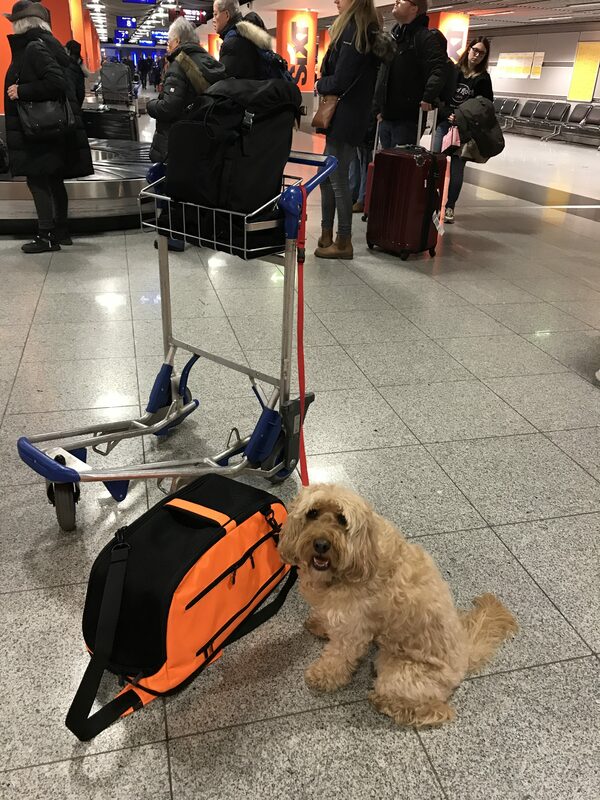 For ease, Mummy left George in his travel bag and I walked on the leash to baggage claim. Here comes BIG Wheelie, Mummy! And then we were outside – in Düsseldorf!!! We made it!!! So where’s Sylvia? 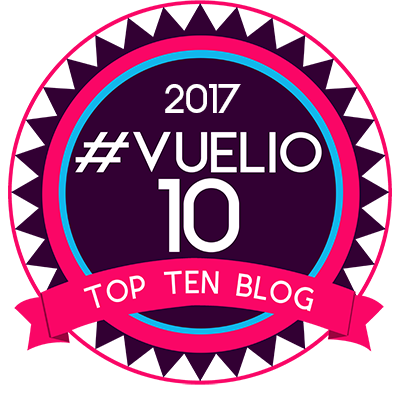 May’s comment: I wasn’t intending to take the train journey back the way we had travelled – besides we haven’t flown yet! After many hours of ferries, numerous train changes, several buses, a few taxis and even a tram – surely we had to fly. 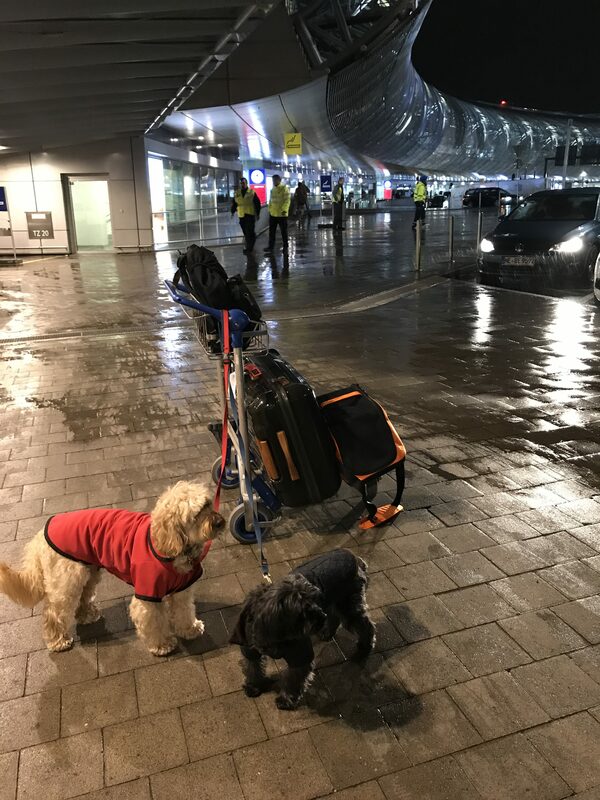 Düsseldorf was a good stop over for several reasons – to see friends for the New Year and to take them to the vet for their de-worming and stamp in the Passport. 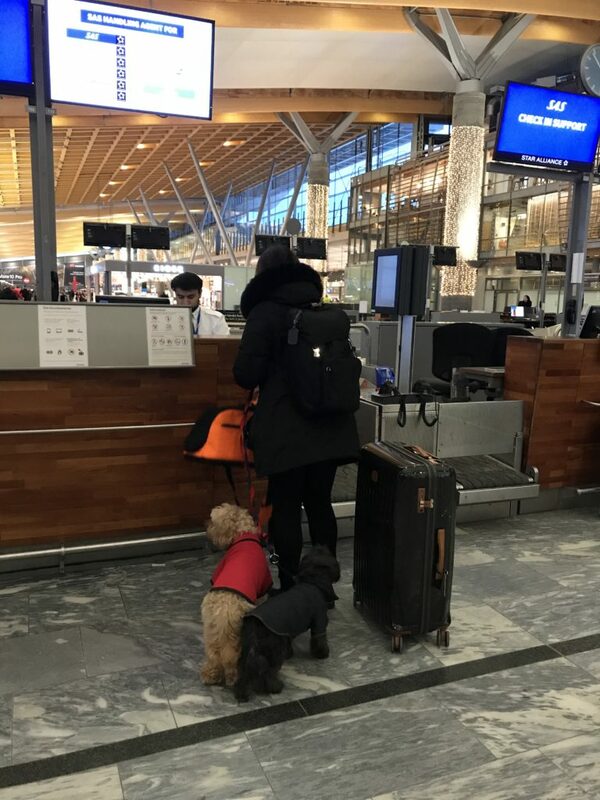 We have flown SAS before to Stockholm and knew they have always been pet-friendly. And they are but as we still cannot fly in cabin into the UK, that gave us a good reason to stopover before making our last journey home to the U.K. But by far, flying has got to be the easiest and fastest way to travel – especially being able to check in BIG Wheelie! I can so manage the rest. 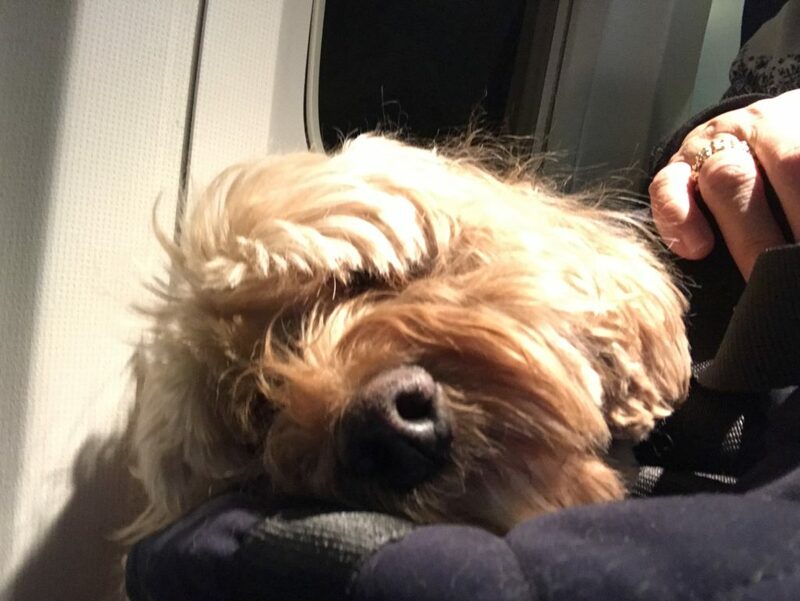 I registered Darcy as an emotional therapy dog to fly with me – we have a letter from my doctor. But it doesn’t always work. 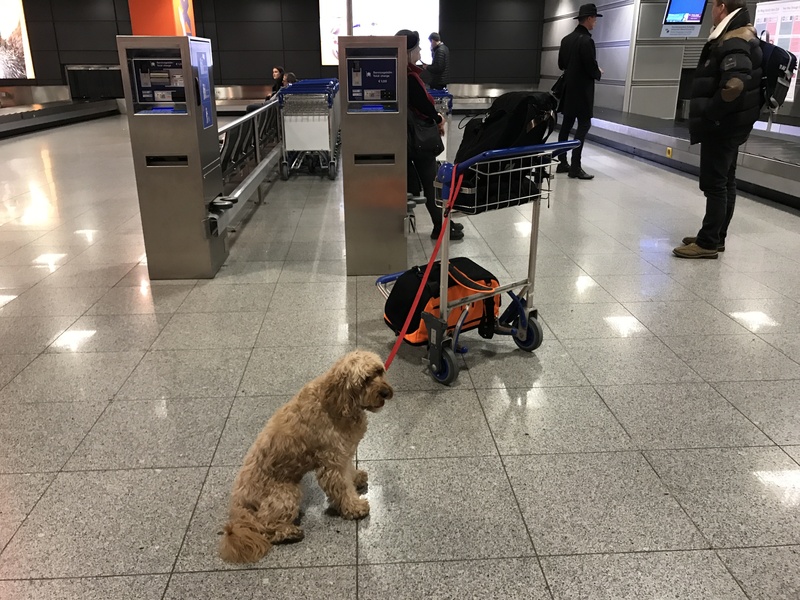 Even then, I still had to use a bag – so unless you can carry your dog in a bag – the emotional therapy does not always guarantee ease of travel. And George is small enough to go inside a bag- so he can almost always fly. And now we’re in Düsseldorf to chill, to see friends for the New Year and revisiting old haunts with my two pooches. In fact we are almost home – it holds a special place in my heart and many dear friends. 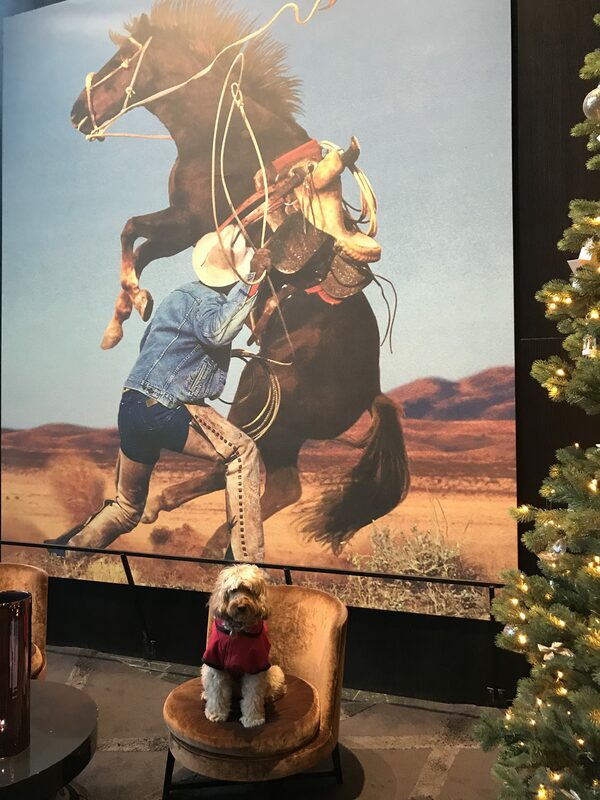 Have loved reading about your adventures! 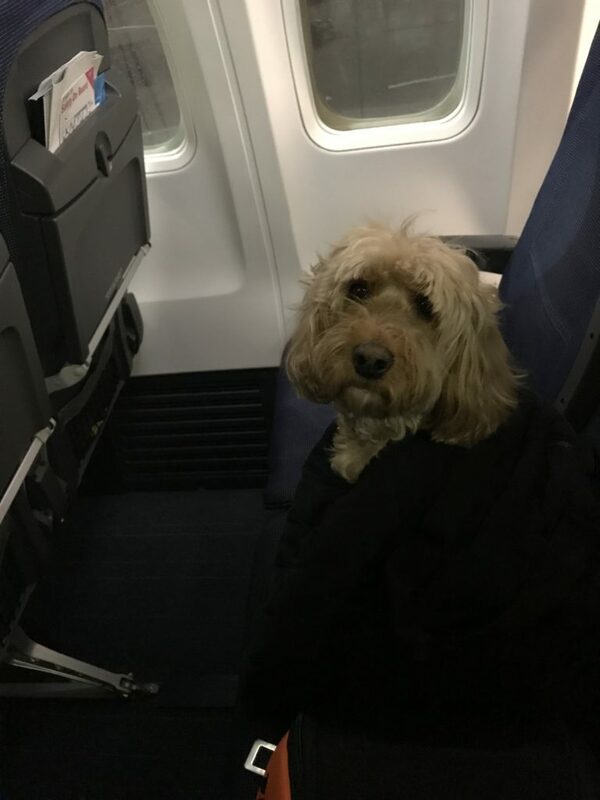 You’ve mentioned that you’ve registered Darcy as an emotional therapy dog to fly with you and that you have a letter from my doctor. Could I please advise on how you arranged that? I’ll write you via email.